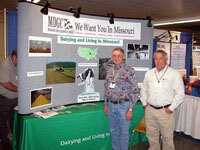 I’m from the Show-Me state so I had to get a picture of the booth for the Missouri Dairy Association. They’re trying to attract and grow Missouri’s dairy industry. But then, so are a lot of other states. While wandering around I found booths for Wisconsin and Minnesota and I know there are more. What do you think is the best state to have a dairy in? Feel free to use the comment feature to post your thoughts.